I was initially surprised when I heard that two of my talented online friends, Bee and Mark, were to collaborate on a novel, as I knew them both to be strong-willed with very definite opinions about almost everything. However, as I watched the partnership and the characters develop, I realised the adversaries they were writing actually benefitted from their occasional confrontations and the result is a very different and satisfying thriller with two strong voices. I am proud to have had a small input as a beta reader and look forward to the sequel and the thrills and spills I know will be forthcoming, both on and off the page! Now that Kill Them Twice is published and the dust has settled, I thought it would be fun to hear their candid answers to some questions about the experience. Q – How did the collaboration come about and have either of you done anything similar before? Bee – Mark and I have critiqued and edited each other’s work for quite some time. We have very similar opinions on what makes a book really work. When I sent him the two opening chapters of Kill Them Twice – first person voice of the protagonist and third person voice of the antagonist – I mentioned how although I thought I’d made a pretty good fist of the latter I’d found it hard going. Alice, aka Halo, may be a killer with an unusual moral code but she is great fun to write and at that time fun was what I was looking for. When Mark said he’d be interested in taking on the evil angst of Shard I was keen to give it a go. In the past I have co-authored non-fiction and biographies but collaborating on a novel is very different. Mark – I’m a strong believer in learning from constructive criticism and have benefited from both online and face-to-face critique groups over the past few years. Bee impressed me with her incisive approach and I knew she could flat out write. Her suggestion that I might pick up the voice of Shard in Kill Them Twice sufficiently flattered me into taking the bait. I’d never co-written a novel before. Q – How exactly did the process of co-authoring work? Bee – You can’t write a novel by committee. The Kill Them Twice concept and characters were mine so I steered the ship. Obviously as we progressed there was much discussion about exactly where we were going and in general we arrived at mutually acceptable decisions. We began by taking it in turns to write our chapters but this proved to be a frustratingly slow process so instead we established what needed to be covered, wrote simultaneously and then cleared up any overlaps or gaps before moving on. Mark – It was an interesting experience for me to play Elizabeth Swann to Bee’s Jack Sparrow as she captained the plot through the Seven Seas. I’m used to being at the helm and I’ve had a problem with authority figures throughout my half-century. Also I’m a “pantser” and don’t like to work to a well-defined plot line as I find it can stymie creativity. Our ping-pong of chapter by chapter edits was very enlightening. It soon reached an equilibrium where we could each anticipate the parts the other would have problems with, and sometimes we set a booby trap or two just to test each other. Bee has a small network of high quality beta readers and they were drip-fed each chapter too, resulting in a work-in-progress so shiny we could see our faces in it. John Goldsmith was one of those beta readers and his review of Kill Them Twice reflects the high level of enthusiasm that we enjoyed in the process. Q – Did it go smoothly? Bee – No, not all the time. Expecting it to would have been unrealistic. I think I can safely say there were times when we wanted to kill each other. Twice. Mark – Yes, it went very smoothly all the time. Whatever Bee says, I’m the one who should be believed. Okay, the truth. We actually became our characters, Halo and Shard. Bee attempted to snipe at me from a safe distance. I was always trying to lure her into the danger zone for deadly hand-to-hand combat (or at least an arm wrestle). It was particularly difficult in chapters where my impulsive creativity had gone beyond the brief and pushed the good ship Kill Them Twice off-course. Bee was the one holding the map and I only managed the occasional glance at it, in-between me – I mean, Shard – brutally murdering his victims. So I did tend to digress and sometimes had to be escorted back into charted territory. But we’re both still alive, which is something I suppose. Q – What were the positives and negatives of your collaboration? Bee – Overall it was a positive experience so I’ll get the few negatives out of the way first. I write full time and have no children. Mark has a ‘proper’ job in senior management plus two school-age children. I failed to accurately factor in the extent to which these commitments would impact on the time available for our project. I rather think he did too. I knew from the outset exactly the tone I wanted for the book but it took some time to convey this to Mark resulting – at least early on – in me regularly bouncing his chapters back to him which, not surprisingly, didn’t always go down well. So for me the downside was frustratingly slow progress and achieving a shared vision. Writing can be a lonely business so having someone equally involved and enthusiastic about the project is a big plus. When we hit problems with issues such as plot holes and logistics two minds were definitely better than one, and the resulting brainstorming often provided new and exciting ways forward. Then there were the lovely moments when Mark’s chapter arrived and he’d introduced a great new angle to the plot or insight into his character. Finally, being a lazy person it’s much less daunting only having to write half a book! Mark – The biggest negative for me was that I only had a limited amount of creative writing energy, and Kill Them Twice absorbed all that for a considerable time. Bee didn’t always appreciate or accept the constraints of my day job and family life, and I wasn’t going to compromise on the many hours that I invest in my beloved karate (as it keeps me sane). I didn’t produce any other writing under my pen name for the duration and I neglected the readership I had built. It was a struggle initially to find the Shard voice that Bee was looking for and some of that early back and forth on edits was quite excruciating. Writing to someone else’s prescription can be a strange experience. Sometimes several days are invested in a chapter only for it to end up rejected. Other times a few furious hours’ work can hit the spot first time. On the positive side, the entire experience has greatly improved the standard of my writing. 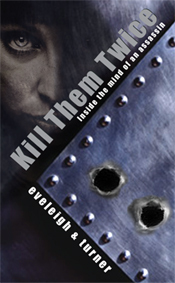 Before Kill Them Twice I was snuggled down in my comfort zone of quirky first person narrative with a constant vein of dark humour. That’s not everyone’s cup of tea and my earlier novels are always going to be niche. The deep third person of Shard and his humourless take on life and death have helped me broaden my range. I now feel much more confident about writing for a commercial audience. Q – Would you do it again? Bee – Had that question been posed as I wrote the closing sentences of Kill Them Twice my reply would have referenced when hell freezes over, but time has dimmed the memory of the pain and I’m left with pride and pleasure in what we achieved. Rather like childbirth. The Author Collaboration Agreement for Vanquish, the next in the series due to be published in 2016, does however include clauses forbidding us to ever meet in person again and for all disputes to be settled by virtual arm-wrestling. I can take him. I can. Mark – As an old hand at karate I’m used to pain. I thrive on it. So yes to doing it again. Writing Vanquish is different from Kill Them Twice in that both plot and writing are collaborative this time. That may lead to fewer or more disputes, I don’t know, but the result will be another great read. I won’t be drawn on the arm-wrestling except that it’s futile to describe an unreachable goal. Rock paper scissors would be a better method of conflict resolution. Bee Eveleigh-Bell’s work has been published internationally and in several languages. She is based in South West France. Mark Turner lives in rural Ireland. His short stories have been published in a number of anthologies and he has penned full-length works of fiction and non-fiction.